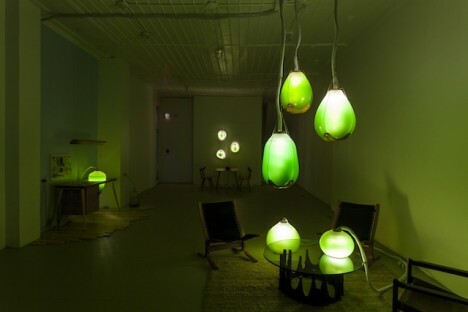 Employing natural processes to illuminate and warm interior spaces, this series of algae-based furnishings combines beautiful glass vessels and organic matter to create lovely yet functional home objects. 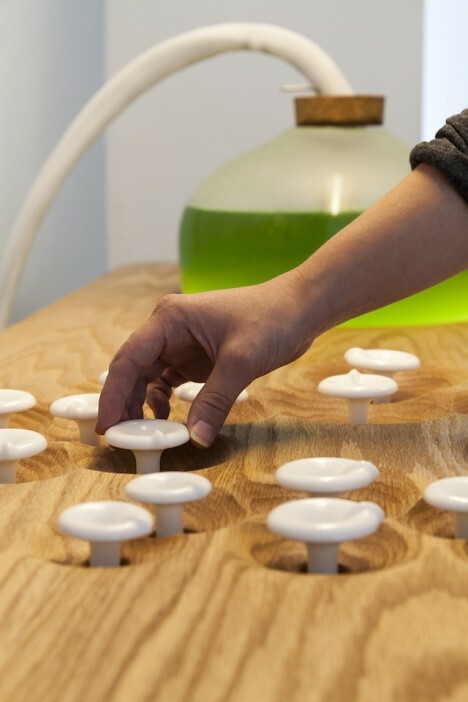 Each fixture generates light, heat and oxygen using methods similar to those seen in bio-adaptive architectural facades. Designed by Jacob Douenias and Ethan Frier (photos by Tom Little Photography LLC. 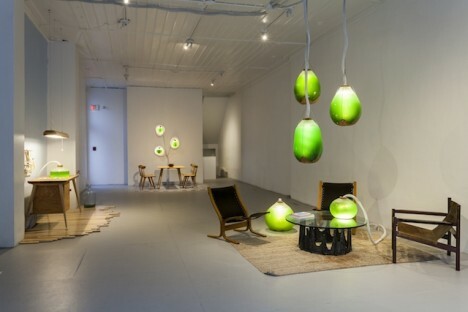 ), objects in the Spirulina series utilize cyanobacteria, “chosen for its rich green hue, light absorbency, and culinary qualities,” set in alkaline water and housed in shapely glass vessels. Found all over the world, this versatile algae can survive and thrive in all kinds of environments and is already widely used in other forms of biotechnology. 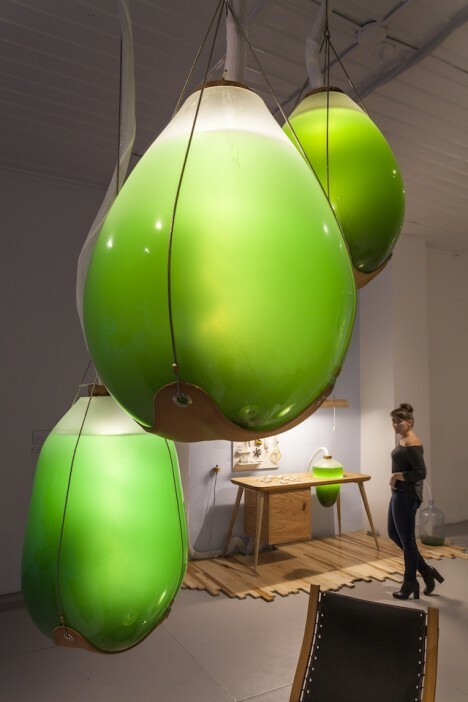 In this commissioned series, a set of spaces show off the various ways these organic home furnishings can be deployed in living and dining areas, popping up from tables, sprouting from walls, sitting on the floor or hanging from the ceiling. The various units are linked by a half mile of hidden plumbing and wiring and controlled via a concealed computer system that both analyzes results and controls each appendage. Living Things is now installed at the Mattress Factory Museum of Contemporary Art in Pittsburgh, Pennsylvania until March 27, 2016. 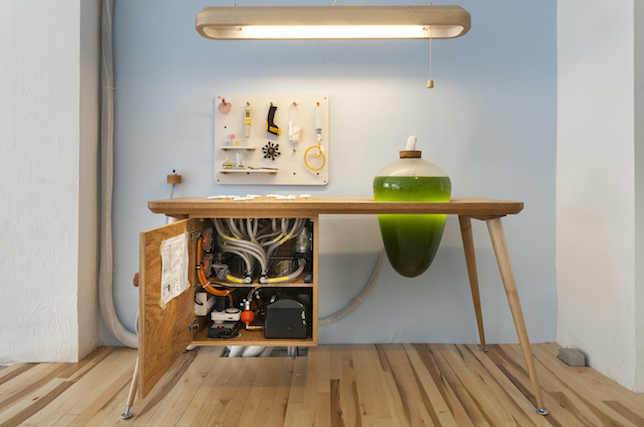 While these experimental installations remain artistic prototypes for now, they and other similar endeavors continue to explore the range of near-future applications for organic matter in everyday domestic settings and built environments.